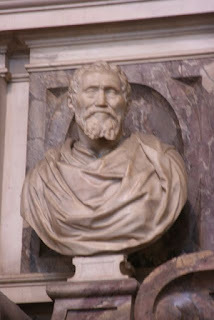 The Gypsy's Guide: Happy Birthday, Michelangelo! Michelangelo was born in 1475 to parents living in genteel poverty. The family lived in Caprese near Florence, where Michelangelo’s father, Lodovico di Leonardo Buonarroti Simoni, had a minor government appointment. His mother, Francesca Neri di Miniato del Sera, fell from a horse during her pregnancy; happily, the fall did not seem to affect the child she was carrying. I record that on this day the sixth of March 1475 a son was born to me: I gave him the name of Michelangelo, and he was born on Monday morning, before four or five o’clock, and he was born to me while I was podestà of Caprese, and he was born at Caprese: the godfathers were those named below. He was baptized on the eighth day of the same month in the church of San Giovanni at Caprese. As was typical for a child from his social class, Michelangelo was sent to live with a wet nurse for his first few years. The nurse was the daughter and the wife of stonemasons, leading Michelangelo to jokingly declare, “If I have any intelligence at all, it has come . . . because I took the hammer and chisels with which I carve my figures from my wet-nurse’s milk.” Michelangelo had four siblings: one older brother, Leonardo, and three younger ones, Buonarroto, Giovansimone, and Gismondo. Their mother died in 1481, the year Gismondo was born. Michelangelo’s sensitive images of women with their children—from the Rome Pieta to the mothers on the ceiling of the Sistine Chapel—reflect the longing of a boy who was motherless from the age of six. There were just too many photos for today, so I made a video instead. 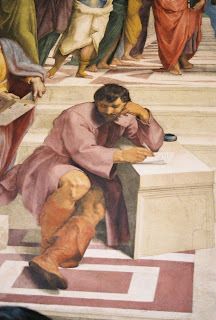 What is your favorite story about or work of art by Michelangelo? And thanks to all of you who stopped by from Deliciousbaby.com's Photo Friday! happy birthday, michelangelo!! thanks for the great article, angela! Excellent post. "David" is my favorite. When I saw "him" in Florence it was love at first sight! My favorite is probably Pieta, I think it's called. For me, it's the Sistine Chapel... although the David is also breathtaking. It's hard to fathom that one man was able to create these works more than five centuries ago. On a recent trip through Tuscany, we passed by the town of Carrara where Michelangelo obtained the white marble for the David. So cool! omg! thanks sooo much! u dont kno how much i appreciate this since i have the renaissance faire & im doing it on michelangelo, but i need some background info but all the other sites are so vague! this sure helps! thanks again!